Babycham was a highly successful pear cider drink that was established in Britain from the early 1950s. The Showering family had a long association with the inn-keeping and brewing trade in Shepton Mallet, Somerset, dating back to the 18th century. Albert Edward Showering (1874 – 1946), a small-scale brewer, owned three public houses in Shepton Mallet by 1928. He had four sons, and two of them, Herbert (1906 – 1974) and Francis (1912 – 1995) were to prove instrumental in the subsequent growth of the family business. Arthur Edward Showering (1899 – 1979) took over the license of the Ship Inn on Kilver Street, Shepton Mallet, which was owned by his father Albert, in 1921. The rear of the Ship Inn housed a small brewery. Showerings was incorporated as a private company in 1932, with Herbert Showering as chairman. Cider production was established by this time. Albert Edward Showering retired in 1934. Francis Showering, a trained chemist, was manager of the Showerings cider mill by 1939. He was a stocky, hard-working, no-nonsense West Countryman. He had become managing director of Showerings by 1949. Throughout the late 1940s and early 1950s, Showerings won numerous awards for the quality of its bottled ciders. After years of research and development, Francis Showering developed a new sterile filtration process that improved the shelf quality of perry (pear cider). The product was clear and sparkling, and reminiscent of champagne. The sale of perry in Britain at the time was very small. The Showering brothers introduced the new product to the Bristol area and assessed its potential. Francis Showering determined to market the product towards women, and the Babycham trademark was registered in 1950. The product was packaged in 4 liquid ounce (118ml) “baby bottles”. In order to prioritise the production of Babycham, brewing ceased from 1952, and apple cider production ended in early 1953. Babycham was launched nationwide from 1953 and demand immediately exceeded all expectations. Herbert Showering was responsible for marketing the product, and advertising commenced from September 1953. Advertising was to heavily emphasise its similarity to champagne. Sales quickly boomed. Advertising agency Masius Wynne-Williams created the Chinese water deer mascot for the brand. A significant factor behind the success of Babycham was that it appealed to the relatively untapped female market. At the same time, bottled beers and ciders were becoming increasingly popular over draught drinks due to their more consistent quality. Furthermore, the brewers who owned much of the licensed premises in Britain readily introduced Babycham to their public houses, as it was not in direct competition with beer. Showerings was unable to meet demand for Babycham in the pre-Christmas period of 1954. Rather than compromise on product quality, which could have increased supply, strict rationing of Babycham was introduced. Babycham became the first alcoholic product to be advertised on British television in 1955. Around £300,000 was spent on advertising between 1953 and 1956. The success of Babycham turned the Showerings brothers into millionaires. Showerings acquired R N Coate & Co of Nailsea, Somerset, one of the four largest cider manufacturers in Britain, in 1956. Showerings was converted into a public company in 1959. Over 1,000 people were employed. By this time Showerings bought much of Britain’s perry pear crop, as well as importing the fruit from Europe. Annual sales of Babycham had reached £8 million by 1961, aided by heavy marketing expenditure. Showerings was keen to reduce its dependence on the Babycham brand. William Gaymer & Son of Norfolk was acquired for £150,000 in 1961. Gaymer claimed to be the oldest cider producer in Britain, and was one of the largest, best known for the Olde English brand. However it had struggled against the greater resources of its major rival, H P Bulmer. The deal transformed Showerings into the second largest cider manufacturer in the world. Showerings merged with Allied Breweries in 1968. Francis Showering was appointed chief executive of the wine and spirits division. 2.5 million bottles of Babycham were produced every week by 1969, consuming the majority of British pear production. Keith Showering (1930 – 1982), son of Herbert, became chairman of Allied Breweries from 1975. By this time Allied was the largest drinks business in Europe. 90 percent of licensed premises in Britain sold Babycham by 1977. Babycham was made with 25 percent apple cider by 1979. The Allied Breweries cider business was demerged in 1992 as part of a management buyout named the Gaymer Group. 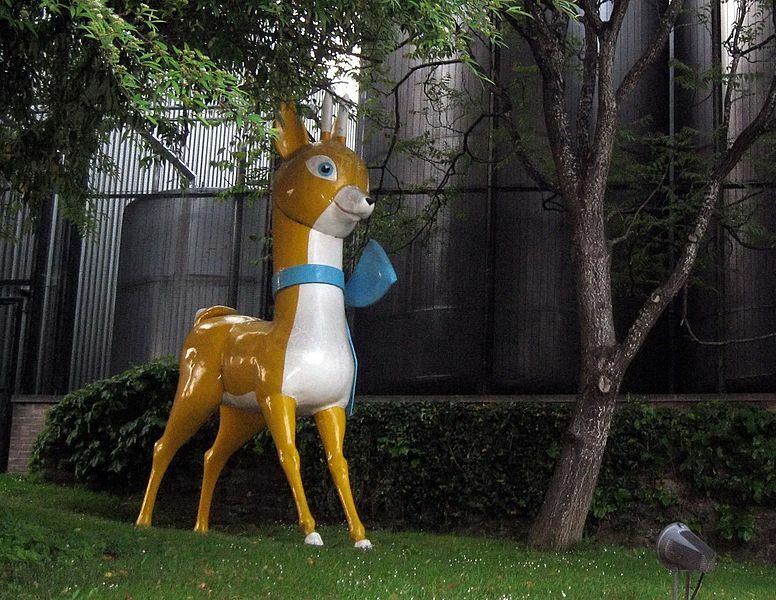 Annual sales of Babycham had fallen to around one million bottles by 1993, and the deer mascot was retired.